During the 1970s Indiana Glass (Dunkirk, Illinois) launched their Contemporary Carnival Glass ranges in distinctive colours, patterns and shapes that are familiar to most collectors. Production continued through the 1970s and into the very early 1980s. 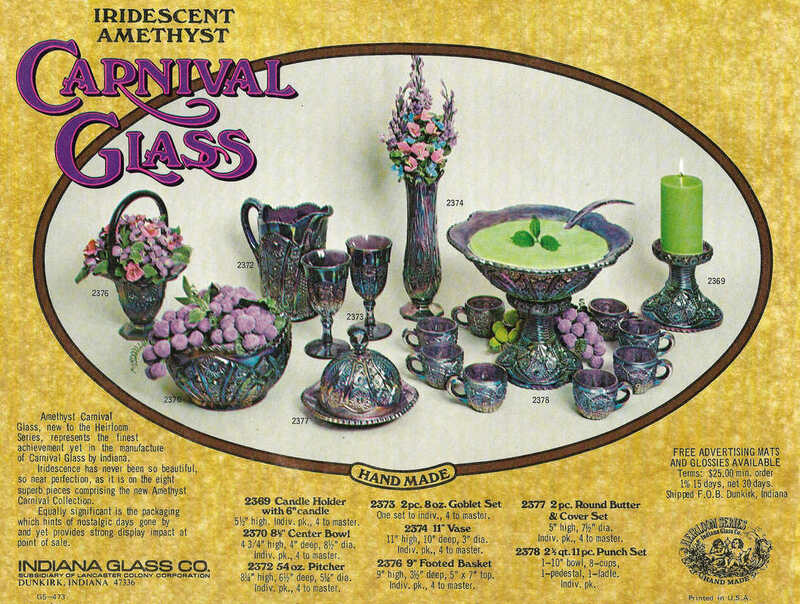 In 1974, Indiana introduced this range of “Iridescent Amethyst” Carnival Glass into its Heirloom Series. It had superb iridescence, and Indiana described it as their "finest achievement yet in the manufacture of Carnival Glass". Indiana Glass catalogue from c.1974, showing the range of "Iridescent Amethyst" Contemporary Carnival in their Heirloom pattern. ​Heirloom - Contemporary Carnival Glass made by Indiana Glass Co.
​​Heirloom is an old Indiana Glass near-cut geometric pattern from the 1900s, but it was was not used for Carnival production until the 1970s. In the early 1900s, it was made in a range of non-iridised tableware shapes. It was known simply as the “123 Pattern”, and it has also been named “Panelled Daisies and Finecut” by Pattern Glass collectors. ​Indiana's Iridescent Amethyst Carnival (shown here) followed on from their first launch of Contemporary Carnival - “Iridescent Blue” in 1971, followed by “Iridescent Gold”. These colours were followed by “Iridescent Sunset” (red to amberina as shown below), and “Iridescent Green”. Purple and rare black were also used by Indiana, and the Heirloom series includes items in these colours. Indiana Harvest / Harvest Grape: Indiana's best selling pattern was widely advertised - see how it was sold in these contemporary ads. Indiana Hostess or Sowerby Chunky pattern? Don't be confused by these two look-alikes"
A wonderful Harvest Grape Souvenir tumbler in Bob Smith's fantastic Tumbler Museum.